DETROIT – The Red Wings got a look at many young minor-league prospects during the 2013-14 season, including Teemu Pulkkinen. 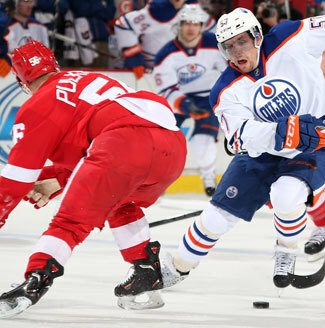 The forward made his NHL debut on March 14 in Detroit’s 2-1 victory over the Edmonton Oilers. Calling up Pulkkinen from Grand Rapids in the American Hockey League was necessary after Tomas Jurco was sidelined for seven games with a rib injury. The 22-year-old Pulkkinen became the fifth Wings’ rookie to make his league debut last year, and ninth in the last two seasons. Detroit’s fourth-round pick in the 2010 NHL draft, Pulkkinen was the Griffins’ leading scorer and ranked second among AHL rookies with 51 points in 60 games at the time of his call-up. The Finnish winger also led AHL rookies in goals (26), shots (175) and plus/minus rating (20) before arriving in Detroit. As a rookie in the Finnish Elite League three years ago, he set the record for assists by a rookie (36 with Jokerit in 2010-11). In September, Pulkkinen was assessed a major penalty for boarding Chicago defenseman Michael Kostka in a preseason game. Pulkkinen also served a four-game suspension for the illegal hit, which occurred on his first-ever NHL shift. Pulkkinen was originally called up in February to give the Red Wings enough bodies to hold practices during the Olympic break while a third of the team was still in Sochi, Russia. The book on the 5-foot-11, 185-pound Pulkkinen was that he loves to shoot the puck, which is something many young players struggle with when they first arrive in the league. But not Pulkkinen, who relies on his heavy shot with a quick release. Center Cory Emmerton, who skated on the same forward line with Pulkkinen in Grand Rapids, was impressed with Pulkkinen’s maturity and skill. While Finland has put a number of quality scorers through to the NHL, Pulkkinen – who grew up in the same small town as former Red Wings center Valtteri Filppula – has admired just one. The 22-year-old Pulkkinen generates a lot of power in his right-handed shot. And because the Red Wings only have left-handed defensemen, Pulkkinen can be used on the off-point on the power play. Pulkkinen, who leads the Griffins with seven power-play goals, likes to set-up for the one-timer with the man-advantage. Pulkkinen led the Griffins with 31 goals and 28 assists through 71 regular-season games during the 2013-14 season.